Our second “Angel Shoutout” goes to Do Something Award Nominee, Ben Simon, who is one of the founders of the Food Recovery Network (FRN). Although he did not win the competition, he is still an inspiration to many teenagers throughout the country. When Ben was in high school, his family took in a man (James) who was homeless and hungry. Ben’s family provided housing and food to James for two years, which opened Ben’s eyes to the fact that there were many hungry people living right in his own city. As it turns out, 1 in 8 people in the D.C. were struggling with hunger. When he got to college, Ben was shocked to see how much food in his dining hall was wasted. Not to mention that food from the University of Maryland dining halls was sitting in landfills, contributing to global warming. In total, 22 million pounds of food are wasted every year on U.S. college campuses alone. To stop this wasteful cycle, Ben teamed up with two friends and created the Food Recovery Network at UMD. They put together a team, got student groups to volunteer one night a week, and worked with Dining Services to start recovering leftover food. In just the first weeks, students were recovering 150-200 pounds of food a day. FRN now has 19 college chapters across 11 states. All FRN chapters use college volunteers who recover leftover food from their dining halls and donate it to local soup kitchens and shelters in their communities. To add to their growth, FRN recently won the $5,000 grand prize in UMD’s Kevin Bacon Do Good Challenge and the $15,000 national grand prize in the Banking on Youth Competition, sponsored by Ashoka’s Youth Venture. So far 194,059 pounds of food donated since September 2011. 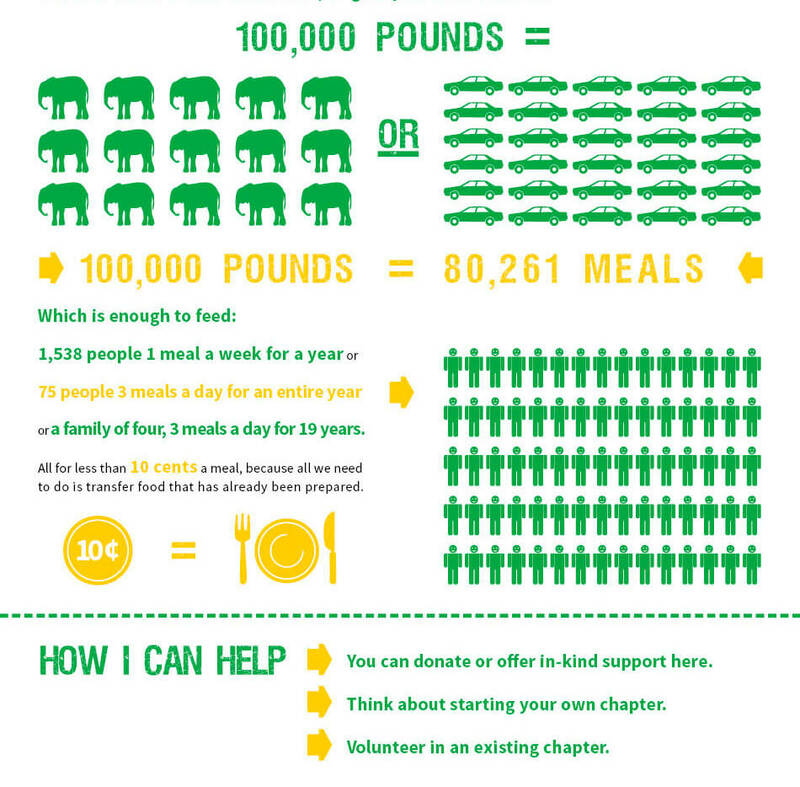 You may be wondering – Exactly how much food is that? Congratulations to Ben for being nominated for this year’s Do Something Awards. I wish you the very best of luck with the future of your organization! Do you know someone who is also making a difference? To recommend someone in your community with an Angel on his/her shoulder, email Rebecca at [email protected].